Before Merge Records began releasing albums by The Magnetic Fields, the label’s best-known band (and founders) Superchunk recorded a rocked-up cover of the first Magnetic Fields single, “100,000 Fireflies.” The original features the gorgeously slight, somewhat detached voice of singer Susan Anway, who left the band after a couple of albums, and she’s backed by a distant drum machine and simple, twinkling piano line, both presumably delivered by MF mastermind Stephin Merritt. 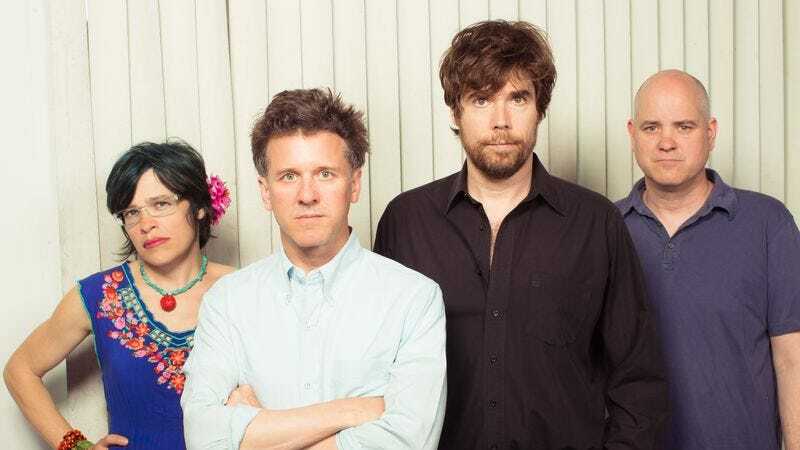 In Superchunk’s hands, the delightfully miserable song (it begins, “I have a mandolin / I play it all night long / It makes me want to kill myself”) takes on rollicking new life, with its piano replaced by electric guitar and the vocals delivered at Mac McCaughan’s fiercest level. The notoriously prickly Merritt probably didn’t like Superchunk’s version—he famously has no interest in the indie-rock world that has embraced his music—but it was at least partially responsible for getting Merritt and Merge together. We asked McCaughan, who was fuzzy on the particulars, but who offered: “I am sure he said something terrible about it in his way, but I would think he was also flattered/puzzled that we covered it.” The versions are massively different in terms of their delivery, but each manages to convey the sentiment—loneliness, despair, the bleak hilarity of existence mitigated by the existence of love—in its own way. And both bands still play the song—originally released in 1991—live on occasion, which speaks to its enduring excellence. Just don’t play both at the same time.